Reiki ("Divine Energy") is a Japanese technique of "laying on hands" to reduce stress, enable relaxation and promote healing. Reiki helps the body's own energy flow in natural, balanced rhythms. Reiki was founded in the early 1900s by Mikao Usui -- though evidence suggests that this method of energy healing existed in Tibet centuries ago. Reiki was brought to the West by Mrs. Hawayo Takata. Today many different styles of Reiki exist, but all have the same basic intent: to channel Universal energy for healing. Reiki helps your body return to balance, a state of internal equilibrium when tension has been alleviated. As your body returns to harmony, this opens a space for self-healing. Energy Dancing in Balance Reiki sessions are 60 minutes for $65 (recommended) or 45 minutes for $50 (doable in a lunch hour). You may also schedule back-to-back sessions in Reiki and Reflexology: 90 minutes for $95. As one client wrote back after her first double session: "I want MORE!!" Reiki is "hands-on healing," but the Reiki practitioner doesn't always have to touch the client for healing to take place. This is energy medicine that affects the entire aura -- which extends out from your body as far as your arms can reach, whether you can sense it or not. I have personally felt strong pressure during a Reiki share when the practitioner's hands were more than 3 feet away from me. It's that powerful. Distance healing is another powerful tool in the Reiki practitioner's arsenal. However, distance healing never takes place without the client's consent. Several cancer centers have begun including Reiki in their treatment plans to address the pain and stress associated with cancer -- it's a safe, gentle, non-invasive adjunct to care. 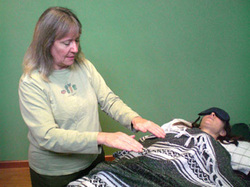 Many cancer patients have described an overall feeling of peace, relaxation and well-being after a Reiki session. For more information about certification classes in Reiki Levels 1, 2, and 3, as well as other classes and workshops taught by my colleague and teacher Michael Rishi Forrester, please visit michaelrishiforrester.com/calendar/.